They say “You win some and you lose some,” but on the night of Neelam Ghar, Sunday, May 27, 2012, only winners and contented people were to be seen—no expressions of remorse on any face. The original Neelam Ghar was a general-knowledge quiz show on Pakistan Television which had a long run in the 1970s and 1980s. The name literally means “the Auction House” in Urdu and related languages such as Punjabi, Sindhi and Hindi. It was very popular in northern India as well as Pakistan. Although the name changed, it celebrated its fortieth anniversary on October 12, 2010, and in February 2012 it reached its 300th episode. This Atlanta version at Berkmar High School was not limited to a quiz show: it stretched to a kid’s talent show, a Couples’ Compatibility contest, and singing and dancing performances by Atlanta’s artists. The icing on the cake was a live performance by Pakistan’s well-known and beloved artist Tehseen Javed, who traveled from New York only to perform in Neelam Ghar. Neelam Ghar offered many prizes such as a flat screen television, a 7” tablet, a karaoke machine, a toaster oven, and many more. While other prizes included gift cards and shopping passes, the raffle ticket winner was awarded a return airfare to Chicago. The evening of Neelam Ghar was alluring, gratifying, and communal all at once. Atlanta’s artist Aslam Pervez hosted this second show of Neelam Ghar, giving a chance to the youth to come forward, and by doing so fulfilling the promise that everyone else takes pledges for. Sidra, Ayesha, Kashian, and Arshaaq were co-hosts of this show that showed great talent. From quirky jokes to harmonious melodies played on the piano, the kids’ round was enjoyed by all. Prizes were awarded to all talents, which made Neelam Ghar worth attending for kids as well. In the Couples’ Compatibility round, couples were asked to guess their spouse’s responses to certain questions. The audience enjoyed hearing spouses try to explain why they got the answers wrong. 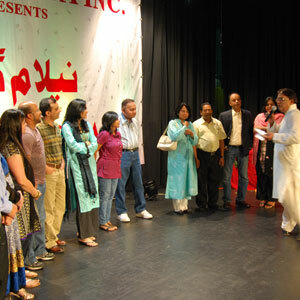 From entertainment to prizes—“Neelam Ghar” in Atlanta. Bait bazi (poetry competition) won the hearts of the audience. Hosts Aslam Pervez and Sidra interacted with the audience, let the audience compete, and picked five finalists who received prizes. The standing ovation by the audience favored bait bazi round as paramount of the evening. Renu Thapliyal, Pankaj Bharadwaj, and Azhar Mehmood swayed the audience with their melodic voices, while Divya and group from Geet-Rung rocked the dance floor with a remarkable dance performance. Raheem Hussein and partner captivated the audience with their smooth Salsa moves. The show concluded with Tehseen Javed’s performance, who had intended to only sing two songs but the audience urged him to continue singing. “Kolaveri Di” was among the songs that the audience sang along to, while the young boys danced to the beat. Tehseen also sang songs that reminded many of their homeland, and brought back memories. While the audience was left asking for more, Aslam Pervez thanked sponsors and organizers. The show brought a sense of community between desis of Atlanta, whilst indulging them with entertainment and prizes.